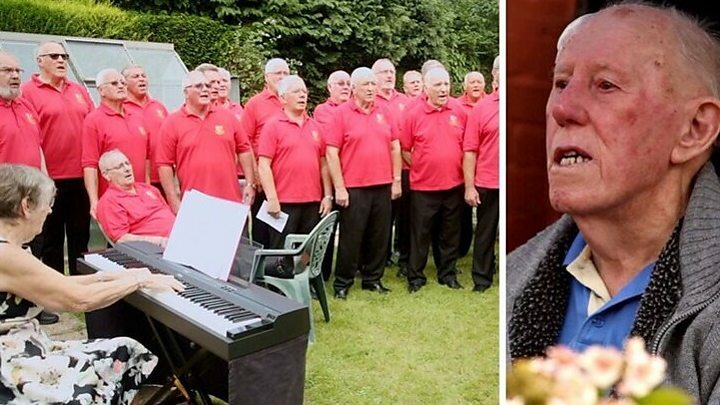 When 92-year-old Emlyn Morris was given just months to live because of a brain tumour, he never thought he would watch a male voice choir perform again. But, thanks to his carer and family, his dying wish came true when Aber Valley choir made a surprise appearance at his Cardiff home. The terminally ill pensioner got even more than he hoped for when singer Katherine Jenkins sent a message. A tearful Emlyn told family: "I can't believe it, thank you so much." The emotional surprise was the idea of Claire James, who cares for Emlyn, a retired steam engine operator, at his home in Llanrumney. "I said it would be lovely if he saw a choir, but he said it was 'never going to happen', because he knows his fate," said Claire. "So I began contacting every male voice choir in Wales I could think of, to ask if they would come and sing for my boy." First to respond was Aber Valley Male Voice Choir who, by a wonderful coincidence, are based in Emlyn's childhood village of Senghenydd, Caerphilly. "We've done more than 1,400 performances all over the world but never anything like this," said choir master Geraint Evans. "But we were more than happy, especially when I found out Emlyn had been a neighbour of my parents and grandparents in Senghenydd." However Claire did not stop there. Buoyed by the response, she set her sights higher. "I thought, 'If I can get a choir, maybe I can get some stars'. So I contacted Katherine Jenkins and [Opera star] Sir Bryn Terfel," she said. "They couldn't make it on the day but Sir Bryn is arranging to either meet or call Emlyn on the phone and Katherine recorded a beautiful personal message." In the message, classical music star Jenkins tells Emlyn she was "sending lots of love." "I'll be there in spirit and I very much hope to get to see you very soon," she added, before blowing a kiss. Claire and Emlyn's family's plan almost backfired when he began to fear they were arranging his funeral. "He saw us tidying up the garden and when I asked him about his favourite songs, he got a bit tearful," said Claire. "I had to say we were just arranging a small party, but he still had no idea and it was a great surprise. "Emlyn is wonderful, the kind of person you'd move the world for. He's so positive and loving even when in agony. "His mouth fell open when he watched the message from Katherine Jenkins and was very emotional when the choir began to sing. But it didn't stop him joining in."